Where is Koh Lanta, and how do I get there? Koh Lanta is a medium-sized island in the south of Thailand on the west coast. It is almost as big as the world-famous resort island of Phuket, and 70km to its southeast. Travelling to Koh Lanta can be done a number of ways, starting by land, sea or air, but ultimately a ferry or speedboat is needed to reach the island. There are ferry crossings from the mainland at Krabi, as well as ferry connections from Koh Phi Phi and one or two other piers, depending on the time of year. Longtail boats and speedboats come from all around and vary in cost depending on the distance and how many passengers are travelling. Getting to Krabi can be done by air to its small international airport or by land on a bus from all over Thailand, or train and bus. I’ve never dived before. What can I do, in just one day? Anyone who has never tried scuba diving before and wants to experience weightlessness and enjoy the beautiful tropical waters around Koh Lanta can easily jump straight in the water safely by taking part in a ‘Discover Scuba Diving Dive’ which is also known as an ‘Introduction Dive.’ There are no special skills or knowledge required and no serious or time-consuming training to worry about. 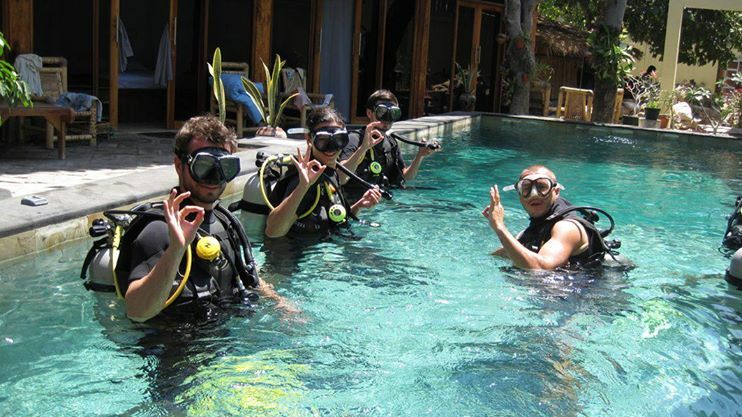 Unlike an Open Water Diver course, in which students are taught to look after themselves when diving with a ‘dive buddy’ and led by a Divemaster guide, those who take part in a Discover Scuba Diving dive are taken care of throughout by a diving instructor. Instructors are more highly qualified than Divemaster guides and there to ensure that you, as a complete beginner, will be able to enjoy your first underwater experience and not have to worry about your buoyancy, remaining air, diving depth, or where to go along the reef. Discover Scuba Diving dives can last up to an hour per dive and be as deep as 12 meters below the surface. 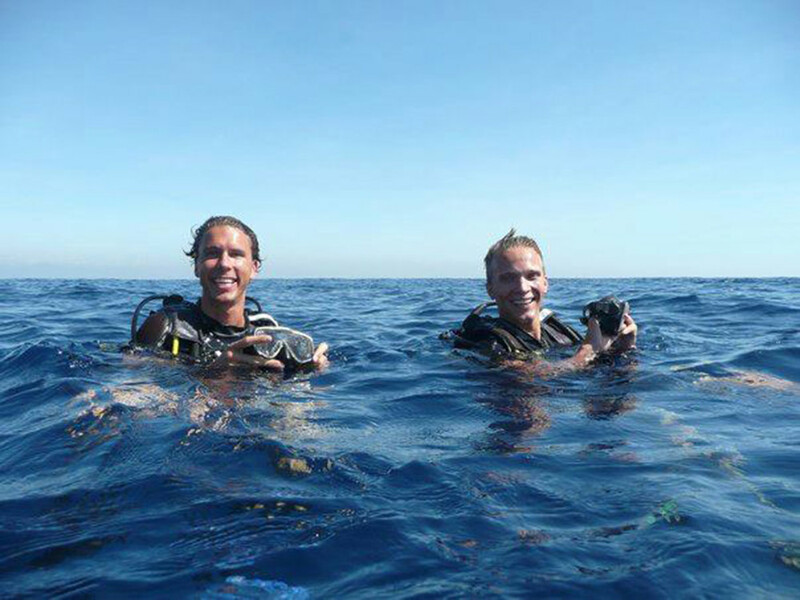 Two dives in one day is most common, but just one dive is also possible. What is an Open Water Course, how long does it take, and what can/must I do? The Open Water Diver course is the most popular diving course in the world, and it enables those who complete it to then enjoy ‘fun dives’ anywhere in the world. 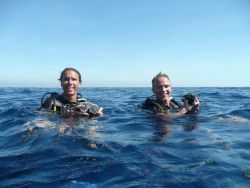 Although there are now one or two lesser dive courses for those who are short on time or money, this is generally regarded as the basic diving course, and is often referred to as a PADI licence, although there are several international scuba diving organizations which offer pretty much the same thing. CMAS, SSI and NAUI are competitors to PADI, but generally accepted as just as good. Most diving centers on Koh Lanta are PADI accredited, and many also offer SSI courses. The course itself takes any healthy person aged 12 or over to become a competent scuba diver, capable and permitted to dive in the open sea with a buddy and/or Divemaster guide. Its duration is normally four days, but it can be done in three without problems, and even sometimes in just two, although this is logistically not easy. Students taking part in an Open Water Diver course start with a few basic theory lessons, which normally involve watching videos and answering questions. The skills are explained by diving instructors, usually to students in groups no larger than four or five students. Course materials, such as books and videos are available in most languages. The first day or two usually consist of the theory sessions and some practical skills learning in what is known as ‘confined water.’ This is normally a swimming pool or sandy beach without waves. 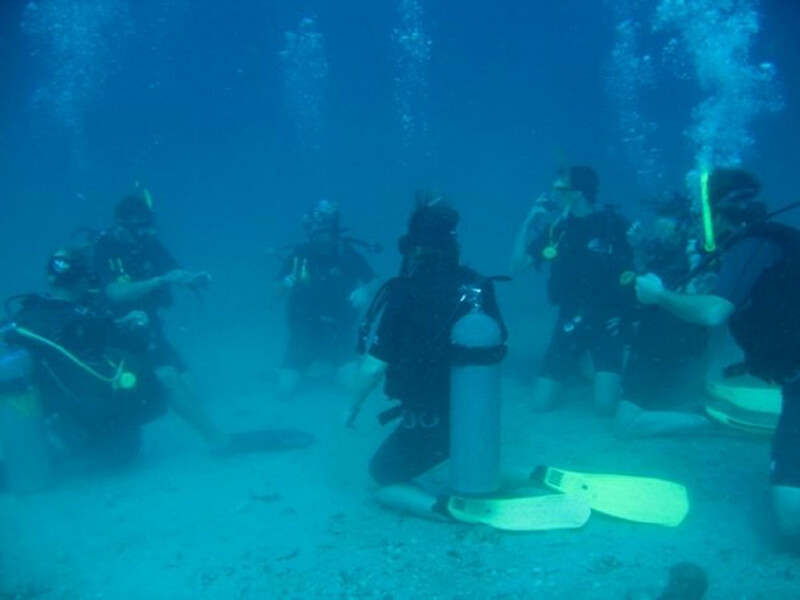 Confined water sessions can last an hour or more and involve the instructor slowly and methodically explaining and showing the necessary diving skills, then the students prove their ability by copying. This practical instruction is completely safe and can be fun, as well. It normally starts in waist-deep water, ensuring that the instructor and students are able to submerge themselves as well as stand up easily and quickly. Should the student want to talk to their instructor or feel any degree of discomfort or even panic, they can safely and quickly stand up. After the students have become accustomed to breathing underwater, communicating and performing a few simple tasks, they then move into deeper, but still confined, water. This is normally in the deep end of a swimming pool or further into the sea off the beach. 2.5-4 metres is all that’s necessary for deeper confined skills. Here, the divers will be able to swim around and experience weightlessness for the first time. The skills to learn, practise and show include buoyancy control which is very important to enjoy scuba diving. Divers learn and practice how to maintain neutral buoyancy by adjusting the amount of air in their BCD jacket and hovering in the water. The final two days of the Open Water Diver course are the most fun and most rewarding. They involve going out into the sea and actually diving around a reef or shipwreck and seeing the marine life. Koh Lanta has a few dive sites off the beach, but most Open Water dives are done from a boat at fantastic locations, such as Koh Phi Phi or Koh Haa. The maximum dive depth increases over the two days, as does the divers’ confidence and ability. At the same time the amount of skills to perform or practice decreases. It’s quite common for the final dive, to a maximum depth of 18m, to be just fun and almost nothing else. At the end of the course, the divers will be certified scuba divers, and won’t have to learn anything else again about scuba diving if that’s what they wish. There are those who go on to learn the Advanced Open Water course and more, but many remain as Open Water licenced scuba divers, using their certification to enjoy ‘fun dives’ at dive centres around the world. Generally the cost of an Open Water course is in the region of $500, but this varies between dive centers and regions. The cost is to cover the instructors’ pay, equipment rental, materials, and certification with the organization such as PADI. Why can’t I just arrive there, and then choose a dive center on my own? You can, but the island is a lot bigger than many people think. Unlike Phuket or Phi Phi, where the resorts and dive centers are condensed in areas which can be walked around, Koh Lanta’s resorts and dive centers are spread far and wide. Without some kind of car or motorcycle, there’s no way anyone could just travel between dive centers or resorts on Koh Lanta looking to see which suits them best. Some dive centres on Koh Lanta are affiliated with resorts, and physically connected in many cases. Others operate independently, but are therefore based in locations to attract walk-in business or near the diving boat pier, but never both. Almost everyone who goes to Koh Lanta to dive has already booked in advance. There are those who go there for a vacation and choose to dive after arriving, but pre-booking is highly recommended on Koh Lanta, whereas on Phi Phi and Phuket it is not necessary. Why are there different prices for the same thing? Unlike Koh Phi Phi, where the dive centers group together and decide on a price-fixing agreement, Koh Lanta diving centers are free to charge what they like for fun diving and PADI & SSI courses. They have to consider their overheads, such as the administration (payment to PADI / SSI) and how much they pay their instructor or Divemaster. This also depends on how many divers are in each group taking part in the course or fun dive. Some dive centers on Koh Lanta are connected to high-end resorts and can get away with charging what the market will pay. This doesn’t necessarily make them better, but the customers are often pampered a little more and may get to travel on a more comfortable boat. What’s the difference between all these boats – liveaboard, speedboat, dive boat, longtail? Basically, there are three types of boats depending on the distance to the diving sites and how many times guests want to dive in a certain period of time. The local dives, not too far from Koh Lanta, can be reached by regular, local dive boat. These are specially designed to accommodate a group of twenty or so people for the whole day. There’s space to move around and have lunch or sunbathe. Some even have a lounge for watching tv or getting away from the hot or wet weather. Some dive centres who are only transporting guests a short distance to the dive site or don’t have many guests will use a longtail boat. These are not really suitable for anything other than sitting in when on the move. There is nowhere to walk around and no toilet. Divers normally roll off backwards when entering the water. When doing a two-dive day trip on a longtail boat, it is necessary to spend the surface interval on a beach. The maximum number of divers or snorkellers on a longtail boat is usually 8-10. Speedboats are used for dive sites which are far away from Koh Lanta, such as Hin Daeng & Hin Muang. These dive sites are also deep, which means that the surface interval must be two hours long. To fit in the journey, the surface interval and two one-hour dives all in one day without forcing divers to arrive before 7am means that a speedboat is required. The cost of the speedboat’s fuel is reflected in the price of diving at such locations. Liveaboard diving boats sail from Koh Lanta and the guests ‘live aboard the boat’ for a period of two days and a night to one week. The boats are large enough to have cabins for up to twenty guests as well as facilities for entertainment and a decent-size kitchen and dining room. Diving from a Koh Lanta liveaboard normally involves taking part in four dives per day – 3 day dives and one at night. The boats sail around the best dive sites within reach of Koh Lanta, and some even travel out into the Andaman Sea to visit The Similan Islands. The long journeys are done during the night, while the passengers are asleep. Scuba diving is a safe ‘recreational sport’ and injuries normally only occur due to avoidable accidents. However, science and the makeup of the human body require scuba divers to ‘take a break’ between dives. Divers who only descend to depths of no more than 10 metres are not going to be affected by the physiological effects of breathing compressed air while under the pressure of deep water. However, most divers go deeper than 10m. and some go as deep as 40m. In these instances, the human body needs to expel certain gases from its system, especially the blood and tissues. This is done by ascending to the surface slowly and taking a break of approximately two hours between dives. This break is referred to as a ‘surface interval’ and normally includes lunch, a nap or even a session of snorkelling. Can my non-diving partner or children come on a diving trip? In almost all cases, the answer is ‘yes.’ Koh Live boats nearly always have a few passengers who come along for the ride or just to snorkel in the crystal-clear waters which are teeming with life near the surface. These non-diving guests pay less to join the trips and nearly always have a very enjoyable day snorkelling, swimming or sunbathing on a Koh Lanta diving trip. Doing so from a longtail boat is not as common as from a dive boat or liveaboard, but still possible. Travelling to Hin Daeng & Hin Muang is not suitable for non-divers, because there’s nothing to do or there or during the long journey. I haven’t dived for a long time. What do I need to do? What about renting the diving equipment, or bringing my own? Most diving trips include equipment rental in the cost, but others separate it. New divers are unlikely to have their own, which is why it’s always included in the price of courses and ‘Discover Scuba Diving’ dives. Many enthusiastic scuba divers come to Thailand with their own complete or partial sets of diving gear. For these customers, there is nearly always a lower price for the trips which they join. Diving gear consists of a wetsuit (to keep you warm, not dry), fins (erroneously called flippers by many), a mask (not goggles), BCD (a jacket to hold the air tank and contain some air for buoyancy control), and regs (system of hoses to breathe from and put air into the BCD). The aluminium air tank and weight belt are always supplied by the dive center and included in the price. Diving equipment rental rates vary, but are generally in the region of 500-700THB per day, which is about $15-20. Do I have to dive with my Koh Lanta Resort’s dive center? No, not at all. Although most people staying on Koh Lanta and wanting to scuba dive will do so with the dive center affiliated to their resort, there are no rules or restrictions. Some guests are lucky enough to stay in a luxury resort for a low promotional price, but want to dive at the best value dive center on Koh Lanta, or dive with a friend or Divemaster who speaks a particular language. This is fine. Normally your dive center will provide a pickup service, depending on the location of resort and dive center. It is important to let your booking agent know your plans before you confirm anything.